Jon Lester's night started with a lead-off triple by former teammate Jacoby Ellsbury (aided by fan interference) and immediately went downhill as the Yankees kicked the Red Sox around 9-3 at Fenway Park. The much-hyped pitching matchup between Lester and Masahiro Tanaka never materialized as the Yankees pounded the Boston lefty for 8 runs (3 earned) on 11 hits and 4 walks in 4.2 innings. The Yankees scored 2 in the first and doubled the lead with another pair in the top of the 3rd and pretty much everyone in the Yankee lineup - with the exception of Yangervis Solarte - got in on the action. Brian McCann had 3 hits; Ellsbury (pictured), Derek Jeter, Carlos Beltran, Ichiro Suzuki and Brian Roberts each had 2 hits for New York. 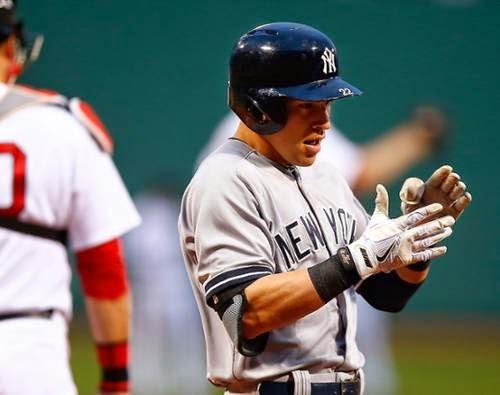 For Ellsbury it was his 1st return to Fenway Park since signing with the Yankees as a free agent in the off-season; he was greeted with a mix of boos and cheers. Jeter was making his first Fenway appearance on his 2014 Farewell Tour. The Red Sox made very little noise with the exception of back-to-back solo home runs by David Ortiz (the 40th of his career against the Yankees) and Mike Napoli in the bottom of the 4th off Tanaka. Xander Bogaerts drove in the 3rd Boston run in the bottom of the 9th inning. New York put the game away with 4 runs in the top of the 5th with the help of a Napoli error at 1st base and Beltran finished the scoring with a home run to right field off Boston reliever Edward Mujica. Tanaka scattered 7 hits over 7.1 innings; he struck out 7 and didn't walk a batter.